Luke 22:7-13 Then came the day of Unleavened Bread, on which the Passover lamb had to be sacrificed. So Jesus sent Peter and John, saying, ‘Go and prepare the Passover meal for us that we may eat it.’ They asked him, ‘Where do you want us to make preparations for it?’ ‘Listen,’ he said to them, ‘when you have entered the city, a man carrying a jar of water will meet you; follow him into the house he enters and say to the owner of the house, “The teacher asks you, ‘Where is the guest room, where I may eat the Passover with my disciples?’” He will show you a large room upstairs, already furnished. Make preparations for us there.’ So they went and found everything as he had told them; and they prepared the Passover meal. Before Maggi’s book pointed it out to me (there’s a reason I’m not a theologian by profession, you know) I’d never spotted that this was two borrowed rooms at each end of the story – the stable of the nativity and the upper room of the passover meal – the last supper. I was struck Maggi’s observation that, whilst an Englishman’s home is his castle, a rented castle is somewhat less secure. This fits with a lot of the news of the last few days – for example, the latest Shelter survey here. The second of the borrowed rooms set in train the ultimate in insecurity – betrayal and death. Yet Jesus trusted in God the father. Finally, I am struck again by the links between Christmas and Easter. I didn’t enter into the debate sparked by this post here – my views will have to wait for another blog post (be warned, there might be life in this blog between the Advent Book Club and the Big Read 14). So, setting aside the question of preaching to the ‘unchurched’ at Christmas, for those of at least some traditions within the ‘churched’ there is a focus on the four last things – death, judgement, heaven and hell – throughout Advent. I give you, for example, my thoughts from last Advent here. And with that focus, the Incarnation is all too close for comfort – a baby born young and innocent, in the knowledge that sacrifice on the cross is the endgame. Which brings us neatly back to the symmetry I was struck by at the start – the borrowed room is the beginning of the beginning as well as the beginning of the end. Today Maggi has us read Luke 1:46-49, Mary’s hymn of praise when she is told that she is to be the mother of Jesus. Words used every day in almost every Church of England church as part of evening prayer or Evensong. As I mentioned yesterday, this isn’t just the hymn of a rejoicing expectant mother. It is a hymn of hope for us all – of praise, of justice, of hope, of resolution. Challenging, rebellious – how many kings and queens, emperors and empresses have heard the words “He hath put down the mighty from their seat” and wondered just what it is that their faith has got them into? Above all, it is for me though, a hymn of hope – the fulfilment of the promise God made to Abraham – the promise we heard on day 8. The whole of the Old Testament has been building up to this – the whole of history has been longing for the Messiah. And he’s coming. As a baby. 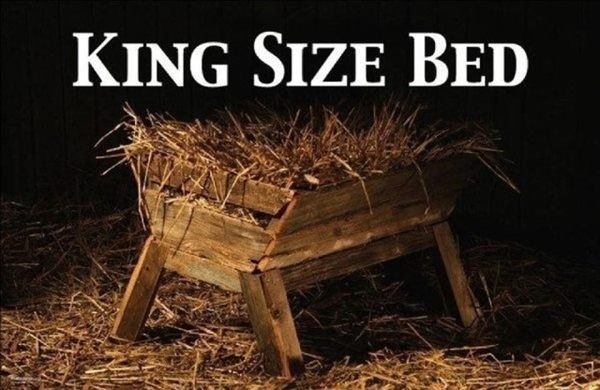 Lying in a manger. Yosemite valley, by me. Taken on our honeymoon. One of the most famous pieces of prophecy about the coming of Jesus today – Isaiah 40:1-5; 9-11. And one I suspect that any of you who’ve ever sung in a choir that’s performed Handel’s Messiah will be unable to resist singing along with. Maggi points out that the word “comfort” used to have a wider meaning than perhaps we think now. It is not just a soothing supportive hug – it could also be encouragement as a parent pushes their child forwards to encourage them to participate in something. At the same time, God is also seen as both strong and compassionate in equal measure, responding as he needs. I’d not thought of this wider sense of “comforting” before. I’d thought it was more about taking heart – “you may be oppressed now, but your Messiah is coming”. I hadn’t thought that it might be “others are oppressed now, your Lord will take action”. Lord – let us rejoice because you are coming. Let us take comfort in every sense – reassurance that you are on your way, and encouragement to keep the faith and witness to that hope of your coming again. Amen. Windows, Washington National Cathedral, by me. Following on swiftly from yesterday’s reading, we have the rest of the story (1 Kings 1:9-18) – where Elijah sees the wind, the earthquake, the fire – and only then does God speak to him in the ensuing silence. Professionally, as an accountant, I see myself in the point Maggi makes that if I find 150% of my hours aren’t enough to achieve my objectives, I immediately expect to work even harder. This may be partly cultural for accountants – but I suspect it is mostly just me. The times when I don’t do silly hours are often the times when I have flashes of what I fondly imagine to be brilliance and insight. And, as I alluded to yesterday, the times when I devote more time than I have or is good for my health to work are also the times when I perhaps feel further from God. Those are the times when eventually I need to creep away from the inbox, the phone and the baying hordes and take time to read, to pray, to make it to Evensong and just listen to God, or to an early moring Eucharist and meet him afresh in the bread and wine. In today’s reading from the story of Elijah (1 Kings 19:1-9) we hear of Jezebel’s threat to Elijah – as he has killed the prophets of her beloved god Baal, so she will kill him. Elijah flees to the wilderness, says to God “You might as well take my life – I’ve failed as my ancestors did” – yet he wakes and God has provided him with food and drink for a journey. Crucially, this is a journey of forty days and forty nights – matching the period that Jesus was in the desert – and the reason why our Lent is this length too. Lord – the last weeks and months have been the busiest of my career. I haven’t always taken the time to eat (meals skipped or eaten at odd hours), to drink, to sleep or to pray. Help me to regulate my life – to seek out normality so that perhaps I too can hear your still small voice of calm before Advent is out. Amen.